The famous Pamukkale is one of the most interesting sites in Turkey. Known as the Cotton Castle, this natural phenomenon is definitely worth visiting, as well as its several historical landmarks. 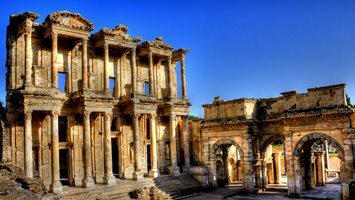 If you are spending your holidays in Sarigerme, and you want to make it as memorable as possible, then our agency has the perfect tour for you – Sarigerme Pamukkale Tour. Pamukkale’s most prominent features are its gorgeous white travertines. These great white mountains are actually naturally made calcified waterfalls and you will even get a chance to take a barefoot walk over their slippery surfaces. 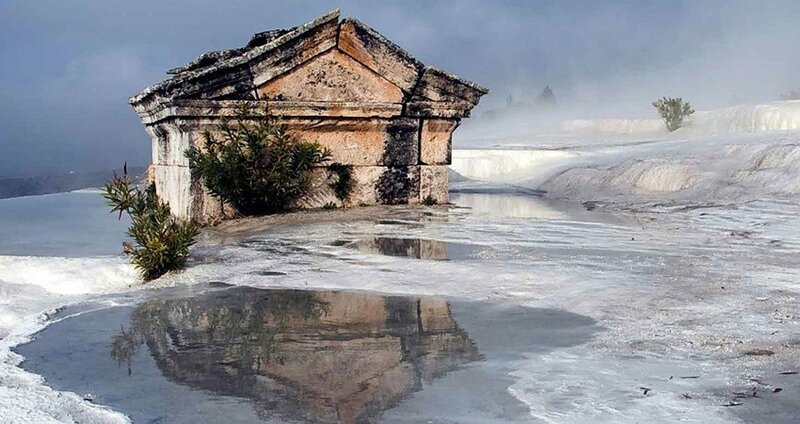 This part of Pamukkale is truly a picturesque site, and it gives out almost fairytale-like impression. It took thousands of years for nature to create these bizarre formations, and once you see them in person you will never forget them. You can also take some terrific pictures and try and capture this unique natural phenomenon on camera. 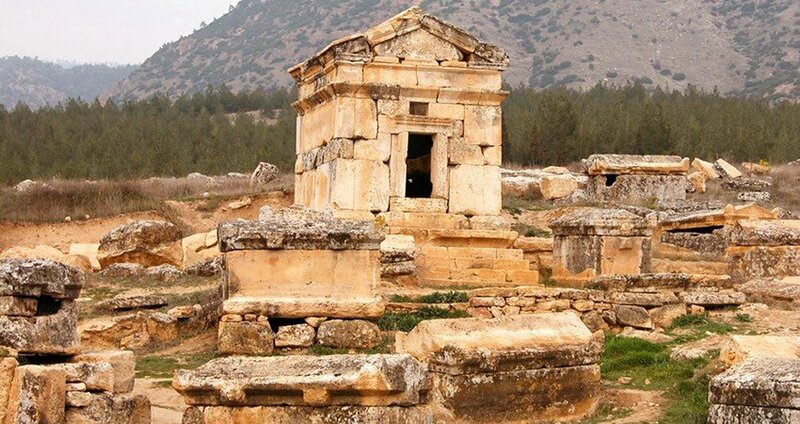 We will also visit the sacred city, Hierapolis, which is a World Heritage Site. This glorious city is more than 2,500 years old. It was considered holy by the ancient people as they believed that it was founded by the god Apollo himself. Today this magnificent city is one of the most popular tourist destinations. 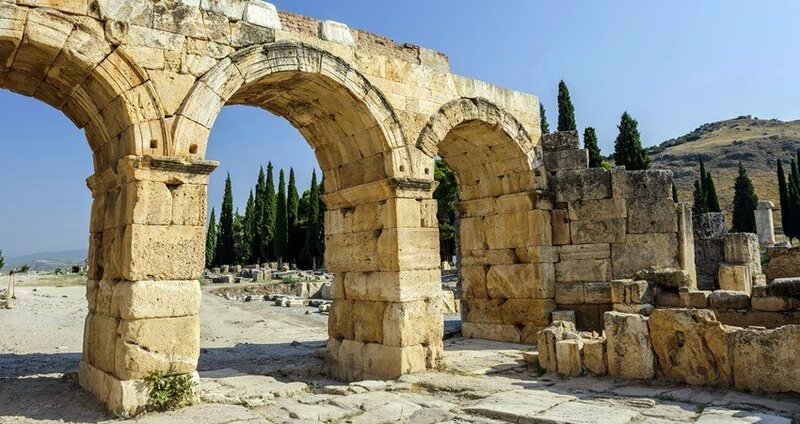 It features numerous ruins of classical Roman architecture, several churches and antique pools. 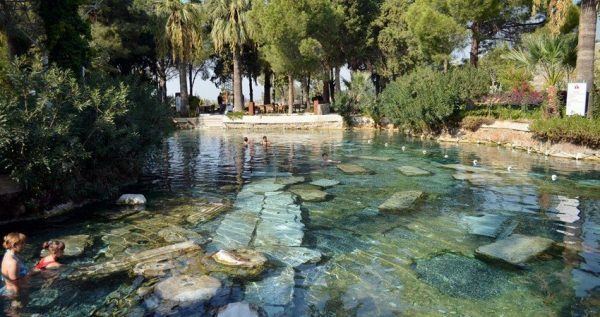 You will also get to take a dip in the famous Cleopatra’s pool, which is actually an artificial pond with a delightful water. 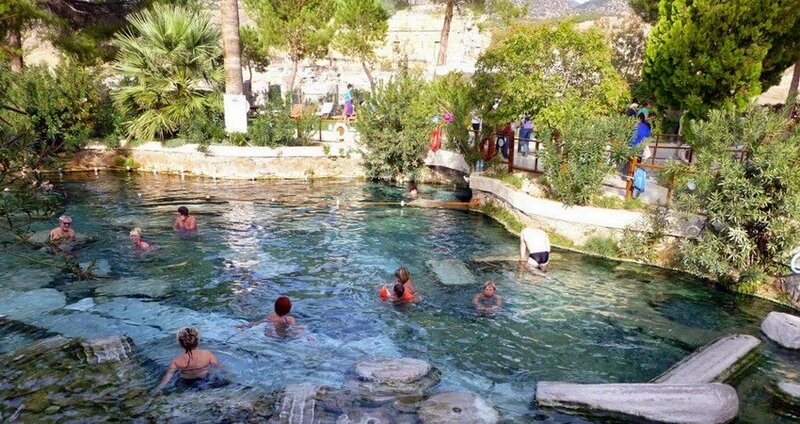 Thermal water in Cleopatra’s pool always has a pleasant temperature of some 35 or 36 degrees Celsius. Mineral waters in the Pamukkale thermal pools are said to heal numerous conditions such as psoriasis, lumbago, eczema, neurological conditions, rheumatism and many others. We should mention that the entrance to Cleaopatra’s pool is charged additionally. 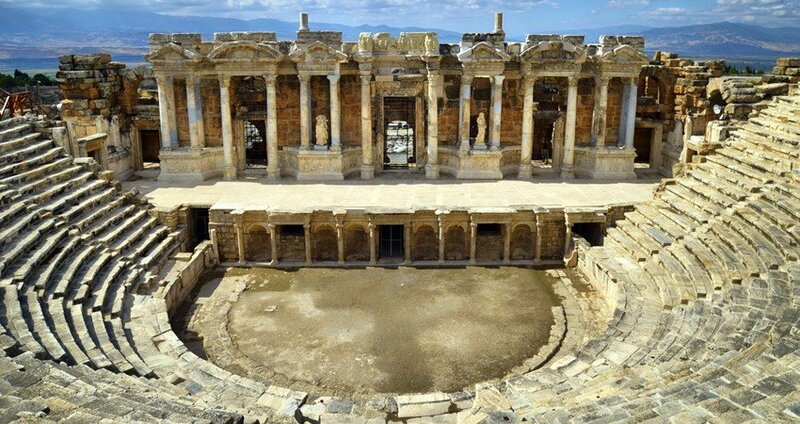 Hierapolis also houses the magnificent ancient theatre, one of the largest theaters of its kind in the world. You can also visit the great Byzantine and Roman gates, as well as several other sites that were rehabilitated and reconstructed by archeologists. Within Sarigerme Pamukkale Tour, we will also organize a delicious breakfast. 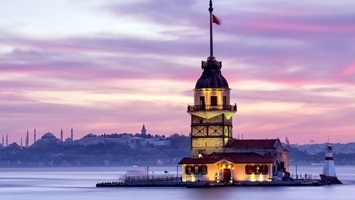 The traditional Turkish breakfast is included in the primary tour price, as well as open buffet lunch, entrance tickets and hotel transfers in both directions. Once our awesome tour to Pamukkale is over, our driver will take you back to your accommodation in Sarigerme. 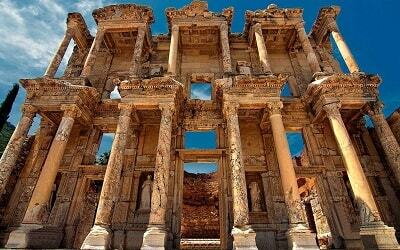 Ephesus & Pamukkale Tour From Sarigerme might be another option for you. Sarigerme Pamukkale Tour starts when our cozy bus picks you up from Sarigerme. We should mention that all of our busses air spacious and equipped with air-conditioning systems, so a comfortable ride is guaranteed. 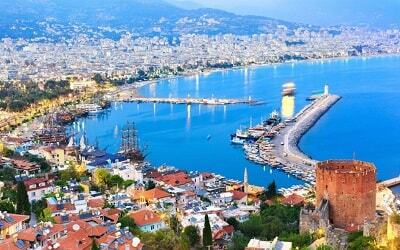 We will take our first break in the lovely province of Mugla, where we’ll enjoy a delicious traditional Turkish breakfast, as well as a free tea or coffee. Once we’ve had our breakfast we will continue with the trip. 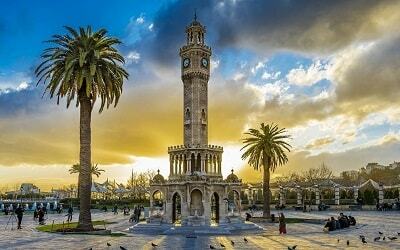 Trip from Sarigerme to Pamukkale is quite long, so we will have another 30-minute pause in Denizli. You will get a chance to freshen up in the toilets before we go on with our trip. 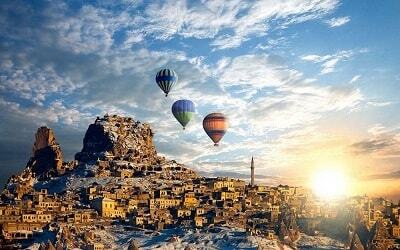 Once we arrive to Pamukkale, the true adventure begins. 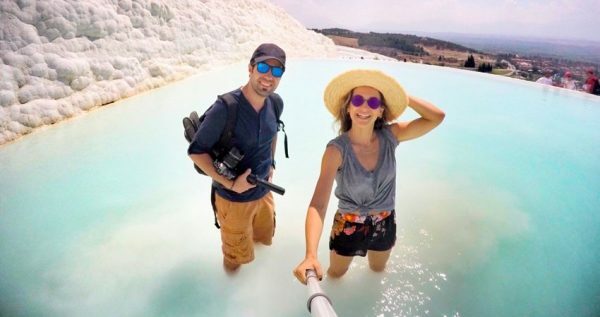 Don’t forget to bring your camera’s because Pamukkale is home to one of the unique natural phenomena – white travertines. These gorgeous calcified waterfalls are a mesmerizing site, and they will leave even the most skeptical among you breathless. You will be able to take a barefoot walk down their slippery snow-white slopes. You will also get to take a walk through the amazing ancient city of Hierapolis and see its well-preserved ruins. Our English-speaking guides will be there with you to tell you more about the history of this magnificent place. We will also visit the famous Cleopatra’s pool and you will have a chance to take a swim in its heavenly warm waters. Aside from this particular pool, we will visit several others as well. Mineral waters in these pools are said to have rejuvenating and healing powers, and the temperatures in all of them are very pleasant. We will stop for an open buffet lunch at a local restaurant, and you will get to taste some delicious traditional Turkish dishes. Lunch is usually a three-course meal, with some sweets and fruit in the end. Once lunch is over, we will head back to Sarigerme. We are expected to arrive back at about 7.30 pm. Our driver will drive you to your accommodation in Sarigerme. Pick up and drop back services, as well as both meals are included in the primary tour price.